‘Alibi’ sleeps up to twelve yacht charter guests in 5 cabins in the following arrangement: A full width Master cabin offers an adjoining office and a his and hers bathroom ensuite (with Spa Pool) which is situated up on the yacht's main deck. She also offers two further superb double VIP cabins with Spa Pool baths and two double and one twin guest cabin, all with ensuites. 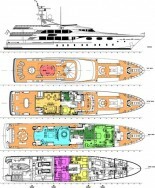 Her crew are accommodated separately for privacy. Luxury motor yacht ‘Alibi’ is a custom 51m / 168’5” four deck yacht which was built by the Italian yard CBI Navi in 2005. She provides excellent interior spaces and accommodation for 12 guests and also offers a very generous collection of well designed outdoor leisure and entertainment areas. In keeping with the yacht’s ‘indoor-outdoor’ flow she boasts a comprehensive selection of water toys and other amenities. Alibi is available for luxury yacht charters in the Western Mediterranean and Caribbean and will consider corporate charters for up to 30 charter guests in port. M/Y ‘Alibi’ offers very spacious and luxuriously appointed outdoor leisure areas on all of her three main decks. She has a main deck which features a large open entertainment area with a round table, sofas and chairs. The main deck also has an outside bar area which continues through to inside where there us a huge saloon, relaxing area and a dining room with a table for 12 guests. The yacht’s large foyer, with a circular staircase, precedes a fully equipped galley which is directly connected to a large pantry. Forward on Alibi’s main deck there is also a beautiful full beam Owner’s suite complete with his and hers bathrooms, Spa Pool bath and large shower and a wide dressing room. The Owner’s cabin has a direct access to a private office. Her sun deck opens with another sunbathing area with large cushions and a Spa Pool, a U-shaped settee, a table for 12 guests. A dumb waiter connects the main, upper and sun decks. She also boats a fully equipped enclosed gymnasium and a huge garage with storage for a 6.25 meter RIB tender, three jet-skis and various entertainment equipment (see below). Her upper deck creates a panoramic open deck area, half moon large sunbathing mattresses and an extendible table for 12 guests and a bar. Forward, there is a very large and relaxing saloon with bar and conversation area with two 52 inch Flat screen TV’s. Forward of the wheelhouse the Alibi features an exterior bathing area which is composed of a circular sofa and large sunbathing cushions. 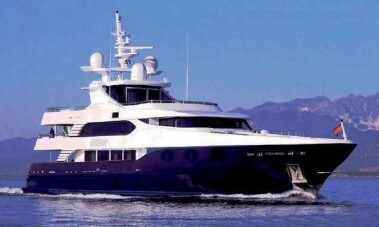 Motor yacht ‘Alibi’ boasts a full inventory of yacht charter amenities, extras and water toys. She has a magnificent Deck Spa Pool, a fully equipped gym - Precor treadmill and Elliptical Trainer, Pilates machine and bench with free weights dumbbells. Alibi has three Kawasaki Ultra 150+ Wave runners, a Castoldi Jet 20.5 foot Tenders 6.2 m, a Nouvurania 14 foot tender 4.2 m, and a Scarab 35 foot (10.7 m) Chase boat (included in the charter fee; dockage, fuel oil at the Charterer’s charge). She has various Snorkeling equipment (20 fins, 14 sets of masks and snorkels), towable toys include a 6 person banana, wake board, water skis, knee board, chariot and inflatable doughnut rings. For communications she has a Sat Com Telephone, Fax, WiFi internet throughout the yacht, Computers hardwire access available in all staterooms, or anywhere by WiFi, a Cell phone and land line available within the GSM coverage. Alibi’s Audio Visual Equipment: Her staterooms have flat screen monitors with SKY TV and other sat channels with DVD and Video on Demand movies from a central movie server which has over 200 movies. There is also a library of over 200 music CD's which is selectable from all outside deck areas. The Twin and double staterooms have 32 inch flat screens, the Two VIP staterooms have 42 inch flat screens, the Master Office 32 inch a flat screen, Master Stateroom a 42 inch flat screen, the Sky Lounge has two 50 inch flat screens, the Bridge deck Stateroom has a 32 inch flat screen.